Going by train to a new place, not sure at which station you’re, how far you’re from the destination, what is your current location on the track, from where your train is passing at the current time — All these information is now available at your finger tips with the newly launched RailRadar project by Indian Railways. I remember a time when I had to travel to Lucknow from New Delhi via a train going from New Delhi to Some other place. I had never been to Lucknow. It was night time and whenever the train stopped on any station, I had to make sure whether I had reached Lucknow or not. The situation was really tense for me as a teenager and because I was traveling alone. But now, that a RailRadar kind of service is available, one can easily mark his current location of the train on interactive map and when he’ll arrive at the destination. This is really easy, great and convenient way to find more info on your train journey, and thankfully will help people traveling to a particular place for the first time. The new RailRadar application is very useful to provide you with data on realtime basis for any train. It indicates the route of the train, the timetable, the current location of running train on Google Map, and the status as whether the train is delayed or in time. You don’t need to provide train number to find all these info. Just spot your train on Google Map within this application.The data is actually provided by more than 6000 monitoring points established across India that connect to a central server, thereby updating the current status of trains (I had actually presumed that the data have been derived with the help of GPS fitted on trains- which doesn’t probably seem to be the case here). This indian railways tracking service is available just for passenger trains, not for cargo trains. All these data can be useful if you want to know the order of rails arriving or departing from a station or to determine which train is suitable for your journey. Currently, Indian Railways tracking service is not available for all trains, but for 6500 trains. The number is likely to increase to cover all rail routes as currently this project is in beta stage. If you’re first time user of this online application, it may seem confusing and overwhelming, so given below is the guide dissected in easy to grasp points to help you with it. Go to railradar.trainenquiry.com and the resulting page will show you Google maps with pre-populated train information. Based on your ip address, it tries to fetch the information of trains in your area. The default location is panned around New Delhi, India. It has search button on the left if you want to search for a particular train to track its information. The map shows train markers arrows in blue colors for trains that are running on time, and in red colors for trains that are behind the schedule or are delayed for some reason. The arrow head indicates the direction of train movement on the map. 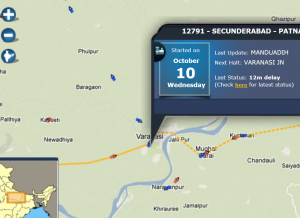 If you click on any marker, it will zoom in showing the current location of the train on the map with much more details along with highlighted train route from the source to the destination in yellow colored line. The dotted yellow colored line shows the routes that are yet to be covered in upcoming time. It will also show other information like, delayed time, next stop/halt/station, ETA (Expected time of Arrival), train number, etc. For a greater precision, you can zoom in more and more by clicking on the + button located on the left of the map. If you click on the India Map button located below the + zoom button, you can switch to other parts of country on a broader scale. The data provided by RailRadar online application is based on realtime tracking but is delayed by 5 or more minutes. So, don’t expect the data to be 100% realtime. So, take a factor +/- of 5 minutes when making your plans as per the timing depicted by RailRadar. 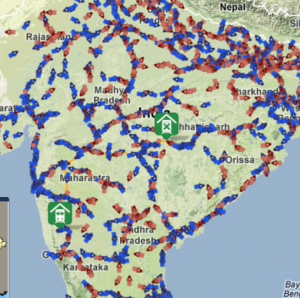 This is really a good effort by Indian Railways but if you’re on the train and you want to use this RailRadar service to track your location, you’ll need internet connectivity which is likely to be unavailable on many routes due to bad network connectivity on trains. So, in such case, it doesn’t help much. We wish if Indian Railways could introduce free wifi internet connectivity on all its passenger trains or just equip each compartment with a common tablet showing tracking data of the train from RailRadar project, it would have been very wonderful. More features might be added later, so we’ll keep track of any update made to this service, like us on facebook to get notified of the latest news related to technology, internet.